Marfan syndrome is a multisystem disease often involving the skin, musculoskeletal or cardiovascular system. In the musculoskeletal system, it can lead to kyphoscoliosis, high arched plate, archnodactyly, atlantoaxial subluxation, and have disproportionately long, thin limbs. The patients of Marfan syndrome may have positive thumb sign and wrist sign, also known as Steinberg sign and Walker–Murdoch sign, respectively. Positive thumb sign means that the distal phalanx of the adducted thumb extends beyond the ulnar border of the palm. Positive wrist sign means that the thumb and fifth finger of the hand overlap with each other. In 1896, Marfan syndrome was named after Antoine Marfan, who discovered it. The thumb sign, which was first described by Parker and Hare in 1945, was named as Steinberg sign in 1966, because he first proposed the thumb sign as a simple test to screen patients with Marfan syndrome. 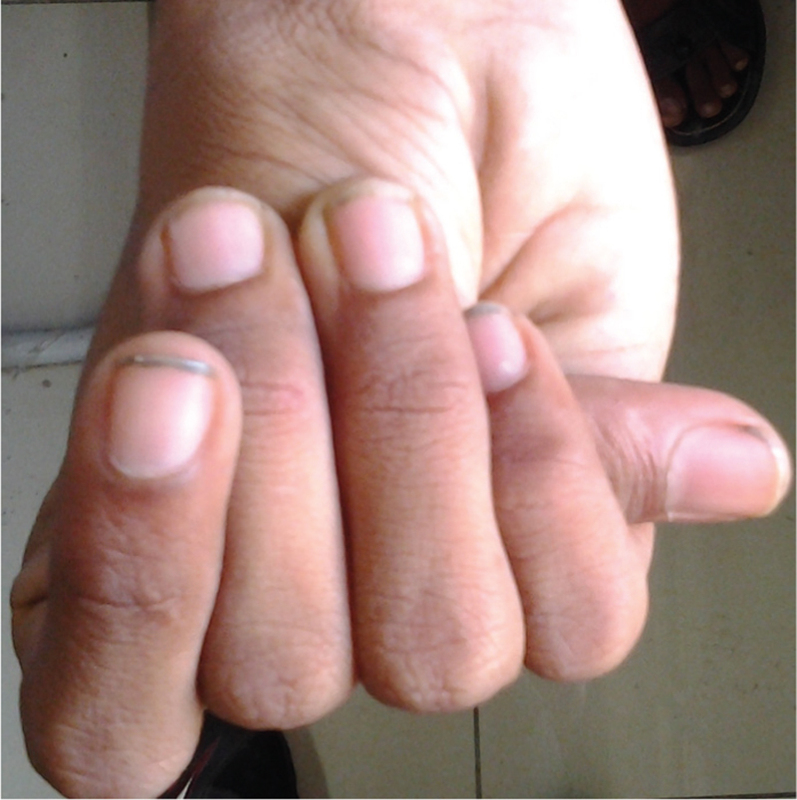 With this sign, arachnodactyly can be confirmed in patients with the Marfan syndrome. The Walker–Murdoch sign or the wrist sign is elicited by asking the patient to grip his wrist with his opposite hand. If the thumb and fifth finger of the hand overlap with each other, the sign is positive [Figure 1]. Steinberg or the thumb sign is elicited by asking the patient to fold his thumb into the closed fist. If the thumb tip extends from the palm of the hand, the test is positive [Figure 2]. The thumb and wrist signs are part and parcel of the diagnostic criteria for Marfan syndrome (both Ghent 1 and Ghent 2 criteria)., Therefore, both these signs aid in the diagnosis of Marfan syndrome. The wrist sign indicates hypermobility and arachnodactyly, which is suggestive of Marfan syndrome, when accompanied by other signs and symptoms. The thumb sign is negative in a high percent of patients with the Marfan syndrome, thus reducing its usefulness, when used alone. It is also positive in a small proportion of normal children (1.1%) and in other collagen vascular diseases such as Ehler Danlos syndrome. The wrist and thumb signs are two important signs of Marfan syndrome that aid in the diagnosis of the same. These signs can be positive in other collagen vascular diseases such as Ehler Danlos syndrome. Faivre L, Collod-Beroud G, Adès L, Arbustini E, Child A, Callewaert BL et al. The new Ghent criteria for Marfan syndrome: What do they change? Clin Genet 2012;81:433-42. Walker BA, Murdoch JL. 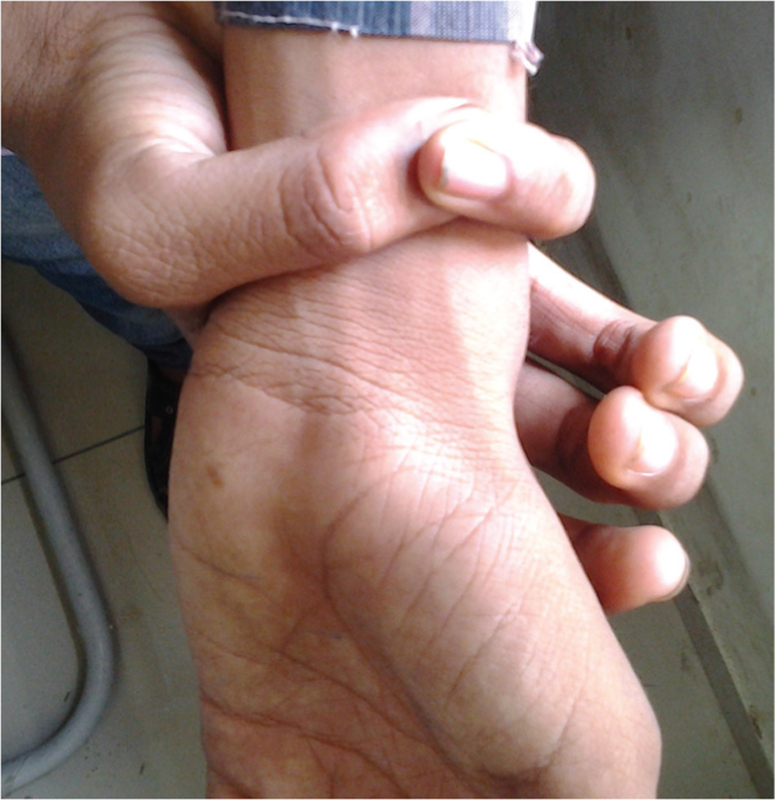 The wrist sign − A useful physical finding in the Marfan syndrome. Arch Intern Med 1970;126:276-7. Pasztor P, Huttmann A. Clinical and radiological importance of the Parker-Hare sign in Marfan’s syndrome. Ann Pediatr (Paris) 1971;18:162-5. De Paepe A, Devereux RB, Dietz HC, Hennekam RC, Pyeritz RE. Revised diagnostic criteria for the Marfan syndrome. Am J Med Genet 1996;62:417-26. Loeys BL, Dietz HC, Braverman AC, Callewaert BL, De Backer J, Devereux RB et al. The revised Ghent nosology for the Marfan syndrome. J Med Genet 2010;47:476-85.